What an arrogant title huh? Just wanted to share my experience in installing a HID kit in the F1. The principles of this install apply to any application where you are replacing a dual filament halogen bulb with an HID kit. I'll start by making some basic points about what too look for/think about if you are going to make the switch to HID system. 1. What kit to get? - Doesn't REALLY matter where you but it from per se. What you are looking for is an H4/HB2/9003 (they are all the same) conversion kit. The F1 came with one of these bulbs installed from the factory. Basically they are a 2 filament bulb held in a single glass ampule. This gives you High and Lo. As for HID, I've seen the older design, where there is a HID low beam, and a halogen high beam. Now-a-days, you can get kits that have both an HID low and high. Its the same source of light, but the bulb changes its position to give the effect of a low and high. In other words, tradition H4 halogens will shine brighter on Hi than on Lo, HID is the same brightness, just a different beam pattern. Now that you have made a decision on what kit to get, and you have ordered it, and its sitting on your workshop benchtop, how do you get it in? First, I'd park the bike about 10' from a wall and turn your lights on. I marked the location of the high beam cutoff with tape. If you don't move the bike during the process, you can angle your new lights based on the beam of the old ones. With the tape markings. The angle is due to the bike being on its side stand. Next you want to DISCONNECT YOUR BATTERY! Safety first. Then remove your fairings. I already had mine off, minus the front cowl. When you remove the front cowl, you need to remove the turn signals from their housing and the headlight connector. Here is what the back of the headlight housing will look like. Remove the rubber boot and unclip and remove the bulb. Now take you new HID bulb. On this model, the metal housing is removable. Careful not to touch the glass. Oils from your fingers may cause the bulb to shatter when it gets really hot! For this part, you don't want the bulb connected to the rest of the harness. Remove the 2 screws on the bulb cover. Here was the hardest part of the job, getting the bulb into the rubber boot. I had to end up snipping the boot a bit to allow the bulb to fit . Make sure you seal it up though! Place the bulb into the housing. The design of the H4 housing only allows it to go in one way. Replace the clip and seal the rubber boot. Before you go and but the fairing back on, you should install the harness on the bike. This is the toughest part. There is not alot of places to mount the ballast or other pieces. To complicate matters, I have a LED kit installed, which runs wires up the front of the cowl. I mounted the ballast on the front center fairing stay. The Hi/Lo switching unit was attached to the fuse box. Connect your stock headlight harness to the corresponding part on the HID harness. I ran these between the fuse box and the connector cluster (see bottom left side of picture, stock harness has the blue heat shrink). I would recommend taping the stock harness and HID harness together to ensure they don't jiggle loose. Plug everything in. I found it easiest to do with the cowl sitting on my knees when I was straddling the front fender. This particular kit only allows for one way to connect it all together (polarity matters here). Your basically done! Replace the front cowl and get it seated. You don't have to bolt it back up now, just make sure its sitting where it should be. Hook your battery back up and turn the key on. HIDs take a minute or so to heat up to get maximum brightness. They will probably start off blue but turn more white when they heat up (depending on your kit). Check the operation of the Hi and Lo. Its hard to see a big difference between the 2 settings, but I'll attribute that to the fact its light out and I am parked so close to the wall. Use the ***** on the back of the housing to aim it if needed. As you can see from the pictures, mine needs lowered a bit. If anyone has any questions or comments, please feel free to hit me up or post them here. If I got something wrong, please let me know and I will correct it. Maybe I can shout out for a sticky for this, or maybe it would do better in a modification forum so not just the F1 people see it... mods? Ideas? ...If anyone has any questions or comments, please feel free to hit me up or post them here. If I got something wrong, please let me know and I will correct it. Thanks man. I just know how I felt when I was researching these. Figured I'd save some others some time. One thing I forgot to mention, whenever you do any sort of modification with wiring near the forks, always make sure you still have full range of motion of the bars after your done. Is it just me, or are your pics not automatically resizing? I have a few thoughts on your install...please don't take this the wrong way. I think you did an excellent job with the write up and I really like how you took the time to explain the differences between wattage and lumens, as well as the kelvin scale for color. However, I can't say as I much care for HID bulbs in reflector housings designed for halogen bulbs. Have you ever met these headlights on the road at night? They are retarded bright to oncoming traffic. Usually the reason is because the reflector was designed for the shorter halogen bulb and it just scatters the light when you use the longer HID bulb. My personal opinion is if someone wants to increase their light output and do it safely, the only option is to upgrade to a projector system specifically designed for HID applications. I have done this with two motorcycles and my 4runner. It is more expensive, but the beam pattern is much better than the reflector setup. I am also guilty of doing the HID bulb in the reflector, and it is something I am going to change when I get back to this particular bike (it is in storage at a friends business). I have heard and read on the web (that makes it true, right? ) 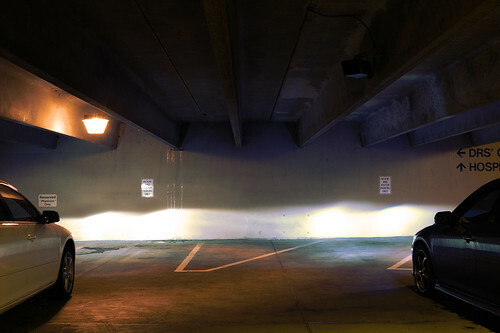 that using the HID bulb in the Halogen reflector actually reduces your ability to see objects at night. Yes the light is brighter, but more scattered. HID Install OK, so I used the same beam cutoff on this site too...but look at the before and after. You can see where I used a HID bulb in the stock projector...a projector designed for Halogen. It sucked. Once I used a HID projector, I once again had a nice clean beam pattern with a razor sharp cutoff. I am sure there are reasons why people only swap the bulbs like cost, mechanical ability (or lack thereof), and a non-suitable headlight bucket (frosted lens), but I think there are better reasons to spend the extra time and money and upgrade to projectors as well. No worries vfr. I wouldn't stand in the kitchen if I couldn't take the heat. I do know the feeling of looking at HIDs in oncoming traffic. I've had times where I couldn't see and other times it was fine. In the past couple years, its been getting better IYAM. About 6-7 years ago when HID kits were all in the few 100's of dollars, I remember looking for one for my rav4 and seeing that all the bulbs you could get were simple a HID bulb, and thats it. No cutoff. No high/low. This newer kits have build in cutoffs that block out a good portion of the light above a certain point. As you pointed out, it is still a bit blurry. More than likely I will have to re-address the aim after I reinsure the bike - when I can take it out at night in a larger area than my tiny garage. It is important to aim your lights after doing a conversion. As you said vfr, the focal point changes, so the aiming needs adjusted too. I don't think a lot of people (eh hem 20 something year old guys) who put them in their civics bother. Definately good to hear from someone who has had success retrofitting their bike. I am not the type of person who like to **** off other people on the road, so I will try and make these as driver friendly as possible. Wierd. The link doesn't look right to me either. I am at work tho and they filter quite a bit. I'll look into it when I get home. Another issue that should be addressed, or at least considered, when installing HIDs is the fact that many bikes have the lights come on as soon as the key is turned. Many bikes have switch gear that allows the headlight to be OFF, even when the bike is running. This mod will not apply to them. On my bike (Canadian import), and many other out there, the switchgear only allows you to switch from Lo to Hi, the light is ALWAYS on. The problem with this is when you go to start your bike, you turn the key on (the HID lights up), and you press the starter button (this kills the headlight), and the bike starts (you then release the starter button, turning the light back on. This cycling is of no real consequence for halogen lightbulbs, but can drastically shorten the lifespan of the ballast. 2) Installing a toggle switch to allow manual override of the headlight ON/OFF function. This way, your light won't come on until you flick a manual switch you install on the bike somewhere. I was going to do option 2, but I don't like the idea of having to remember to switch the light on and off all the time. For those who don't read circuit diagrams, it is basically uses your oil pressure circuit to turn off the lo beam of your headlight. The theory is when you turn on your ignition, the oil pressure is 0 (bike isn't running). You will notice that the red oil pressure light is on. When you start the bike, the pressure builds and the light turns off. Using an NC (Normally Closed) Relay, you can have it where the headlight is off (switch is open, signal circuit is complete (oil pressure switch is closed)), or headlight on (switch is closed, signal circuit is broken (oil pressure switch is open)). An added benefit to the way this is designed is that if you want your headlight on, but the bike off (e.g. parked on the shoulder), you can use the high beam. Ideas, opinions, comments all welcome. I plan to do this in the coming weeks, so I'll post a detailed How-to if there is any interest. I just wired in Euro spec headlight switches into my bikes (I have two with HID). Now I can turn off the lights whenever I want. I am in the military and the guards appreciate it when I turn them off for them. But your idea is pretty good as well. Right, I should have included that in my list - as that was the first option I looked at. Fleabay didn't have any in good nick for a decent price when I was looking. Definitely a good way to go, though. Thanks for the info...honestly, FWIW, these HID kit, replacements parts etc. are getting cheaper and cheaper....a few years later, there may be some newer technology IDK? For FWIW, replacement parts is fairly cheap....I wouldn't go thru the trouble to override the bike electrical just to extend lifespan of the ballast...if it blows, get a replacement off eBay or what not...that's just me though....I don't like cutting into Factory wires to add a switch. Quick Reply: Everything you need to know about HID installs.